Real-time monitoring is 24/7 energy intelligence at your fingertips. Access your energy consumption anytime, anywhere and control your costs. Real-time monitoring creates opportunities that allow you to adapt to market challenges and maximize savings. 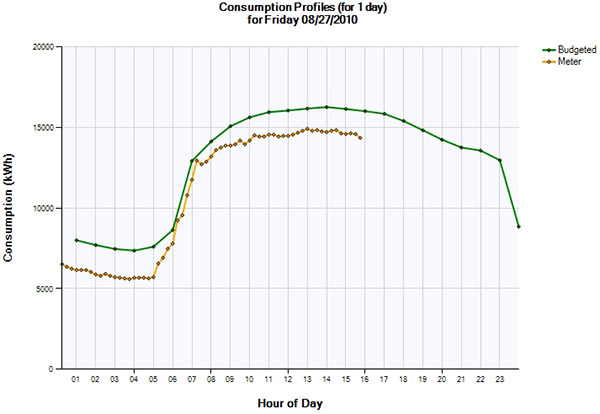 It frees up your time, giving you peace of mind knowing that our system is managing your energy usage, 24 hours a day. Best of all, our real-time monitoring tools will save you money. What Does Utility Alarming Do? Deviations occur against Solution 105’s forecasted load levels. Specific pool-price thresholds are breached (price spikes). Alerts are communicated via text, email or fax. With our monitoring systems in place you will be alerted of things like unusual usage and spikes in pool prices. Pre-set parameters and automated responses will ensure you’re optimizing your energy usage and show what adjustments need to be made. Are you ready to gain control of your energy usage and costs? expected load over the course of the 24-hour period.